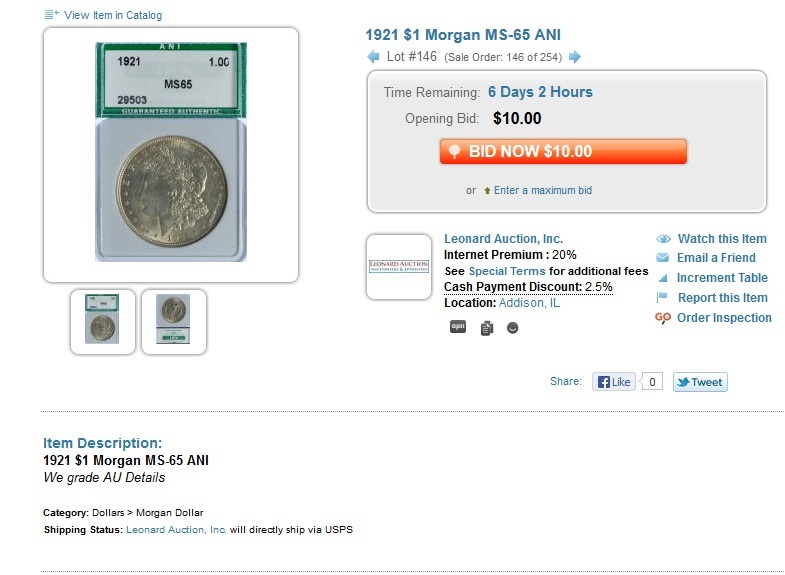 In the photo below, the slab states that this common silver dollar, a 1921 Morgan, is gem MS65 worth about $150. Leonard calls this an AU slider with details, and those are harsh cleaning and damage, rending this lot to silver melt, about $20. In the photo below, the slab states that this common silver dollar, an 1896 Morgan, is a super gem MS66 worth about $650. Leonard calls this choice BU, or MS64, worth about $80. 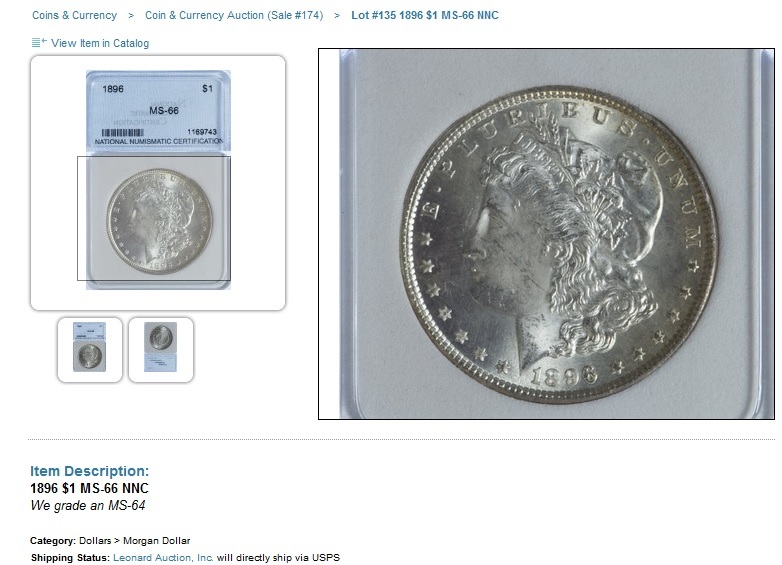 In the photo below, the slab states that this common silver dollar, an 1885-O Morgan, is MS60 worth about $25. 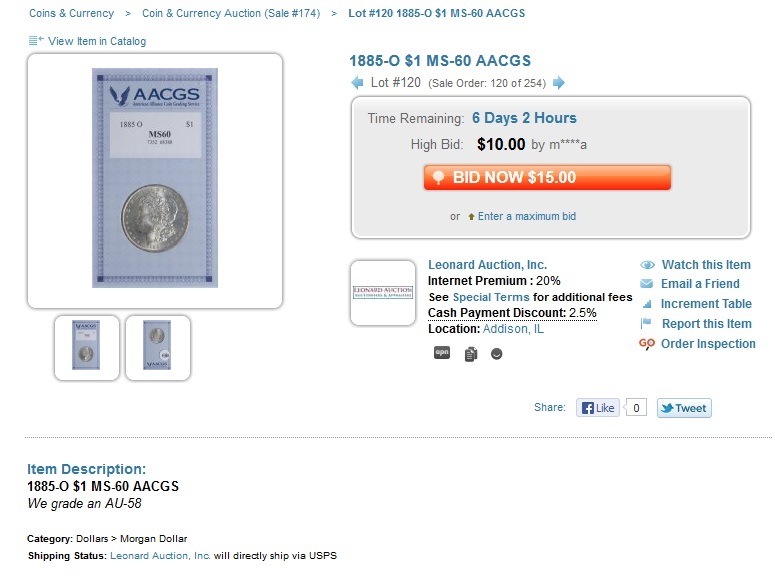 Leonard calls this an AU slider, rending this lot slightly above silver melt, at about $22. This auctioneer below is not as conscientious as John Leonard. 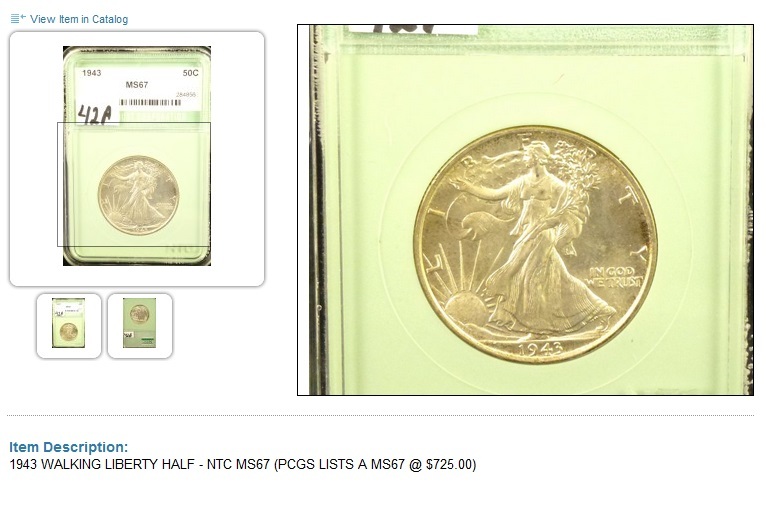 He consistently makes two numismatic errors, hyping bottom-tier slabs (error 1) and citing PCGS values (error 2). See lot below. These are serious ethical errors in the coin collecting world, and this auctioneer who sells coins regularly and has some of the best consignments on Proxibid–featured on occasion in Coin World–knows, or should know, better. This is not worth $725 but probably $30 at low-mint state. The coin also may be cleaned, but we cannot discern that from the photo. (We see trouble spots in the right field at about 2:30 o’clock.) We would not bid on this, treating the coin as low-mint state or slider with details. As a rule, PCGS and NGC are top holdering companies, but each does have different standards. Each company has its own values site on the Web. For ANACS and ICG, use CoinValues or Redbook values. Some holdering companies, such as PCI, ACG, SEGS, and Numistrust typically grade a few points lower than PCGS or NGC; but it’s best to treat those coins as raw, too, learning about grading (see our regular “Find the Flaw” feature) and bidding on the coin rather than the holder. This entry was posted in Articles and tagged ACG, ANACS, CoinValues, ICG, NGC, Numistrust, PCGS, PCI, Redbook, SEGS. Bookmark the permalink.